Pictures, sketches, and descriptions of my hiking adventures. 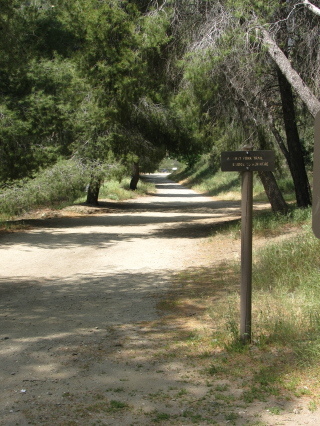 Icehouse Canyon is on a right hand straight (the road turns sharply left) just after Baldy Village. To enter the Wilderness some two miles up, you need to get a permit. We also needed a hang tag to hold the Golden Eagle so we were good and let them count us. That didn't make parking any easier on a Sunday morning. Backpackers and early(er) risers had gotten all the real spaces in the large lot, and quite a few of the imaginary ones. I was able to imagine one more spot on the second time around so we weren't so good on the parking but we weren't blocking anything either. The trail itself goes up at a steady, determined pace. It is about 3.6 miles of constant up. It does not go flat, it does not go down, it just climbs and climbs until it gets to the saddle. There is one junction along the way which is actually just another way up to the saddle but takes about two miles longer to get there. We took this going down, freeing ourselves of most of the crowd. 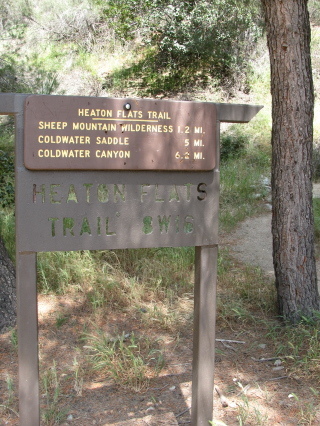 As with most the area canyons, there's cabins along the way. The first few are actually kept up and populated although there is some evidence that they're not quite all still there. Lost cabins can be seen from time to time a few miles up, but used cabins don't go as far as the first mile. Once this was someone's cabin, now all that is left is a chimney and a bit of ground that is clear but no longer flat. As we got up near the end of the densest area of cabins, we started seeing many lady bugs on the plants. 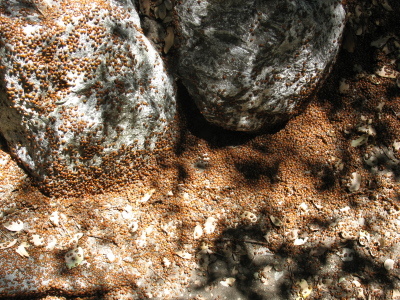 A little further and we found what we thought was a huge swarm of the things. That was until we rounded the corner and saw them gathering together seeming to be five deep in places. 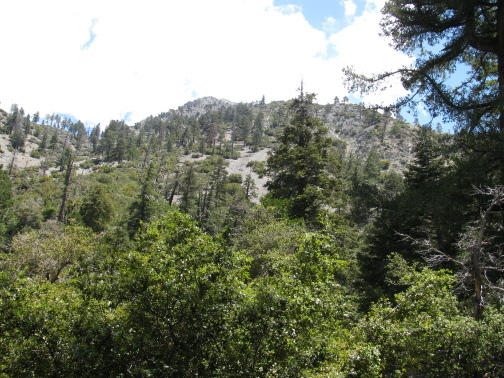 As we continue to climb, the vegetation becomes more sparse, especially the undergrowth. Following the trail, we found ourselves on the other side of the canyon without crossing over the stream which had water below. We can see far up the slopes easily all along the trail. The trees are huge and the slopes make them seem as bushes along the way. One of the lesser slopes which doesn't dwarf the trees so far beyond what one would expect. The "Bridge to Nowhere" isn't really such. Hike information can be found here. The instructions for getting there could be improved quite a bit, though. After getting off on Arcadia in Arcadia, turn north and follow the road out of the city and along the reservoir. Turn right on East Fork Road to cross a large bridge over the river and wiggle around a little more. That road does dead end at the ranger station if you go around the hairpin turn it talks about, but if you catch the road into the Sheep Mountain Wilderness to the left on that hairpin turn you pass a few trailheads on the way to the end of the road. Park in the large lot by the gate on the road and continue down it passing yet another trailhead to some other destination. 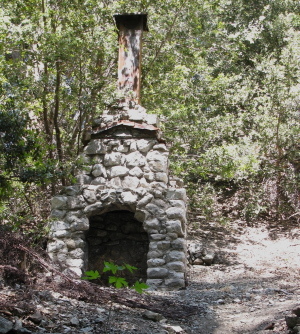 The trail follows the old road route up to the bridge built for the road. At least half of it is actually on the old road bed, but there are places where the roadbed are long gone and the bridge at the top is the only bridge left. Also, where it says there are six stream crossings and you will need waterproof shoes even in low water needs some correction. 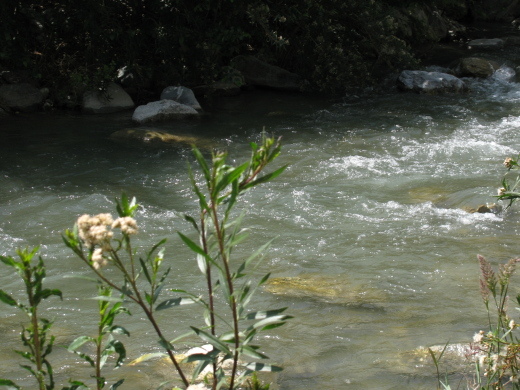 This is the east fork of the San Gabriel River, as it says on the map, and as such is, in fact, a small river. I crossed with water halfway up my thighs on a few of these. Bring shoes that drain well. Waterproof is probably a bonus, but I haven't met any boots that handle when the water goes over the top of them without getting wet. I started the hike a bit late. I never quite got decided to go until it was the latest time I could start since no one else was coming along. On the way up, a yellow jacket took the time to smash itself into the window edge, bank off my pony tail and drop down my shirt. In its last moments, it took a bite of my back. I was further delayed since I've never been stung by a bee so I had to figure out what it was and make sure nothing bad would result. I was given some ice by a fellow on the road which helped greatly. (Ouch!) I decided to go on even as it got later since 9 miles is less than 5 hours at 2MPH which should be a reasonable pace for a trail that supposedly only rises 1000 ft. I could still be back before dark. Turned out I wasn't the last to start. As I came back down, I met two more on their way up and the couple I'd met about the same place when I was going up were slower than I was even with stopping for a quick sketch. The trail follows the old road. Here it is still a usable road and it will be until the first bridge that's gone out. The carnage of the old bridge is still in the river there. A drier trail (probably) leads up out of the canyon for those who are more sensible with their trail choices. It looks like there could be some reasonable hiking up this trail too. Anyway, I took off up that road up there. The photo shows the end of the road where it used to cross the river. The trail passes down to the side of the river and continues that way until rocks force it over. This first crossing is one of the deep ones going halfway up my thighs. I initially crossed it taking off my boots. This was a poor choice since footing is more stable when your feet are protected and I managed to bruise the top of my left foot on the way over through some of the swifter bits of water. I was hopeful there were only a few crossings. No more room to walk on this side of the river, time to dive in and cross it. Choose swift or deep, but climbing instead won't work well. Trip reports full of pictures and maps, a little sightseeing, sketches in the wild, and a few MYOG projects can be found here. The first post of each year is a table of contents for that year, for an index of everything try the Master List of Hikes. There are often even more photos for a hike on my picasa. Quantum mechanic and artist. Should be looking for stability, but always searching out new trails instead. Day 3 – Trail Maintenance?! Tamarisk, Nordhoff Peak and Chorro Spring: February 2, 4 and 7, 2014. If you like what you see here, feel free to follow using the RSS feed (I like to do this with The Old Reader) or by email. Maybe even like it on Facebook.